Friday and Saturday 10 - 6, Sunday 10 - 5. Pre-Festival activities begin the weekend before. 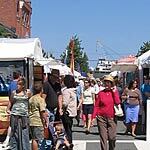 In its 5th decade, the Anacortes Arts Festival is the first Friday, Saturday and Sunday in August. Art in all its forms includes 275 juried Booth Artisans, 30 food vendors with regional and ethnic flavors, 3 stages of free music, Arts at the Port fine art exhibits, working artist demonstrations, youth activities and much more. Located on Commercial Avenue in historic downtown Anacortes.